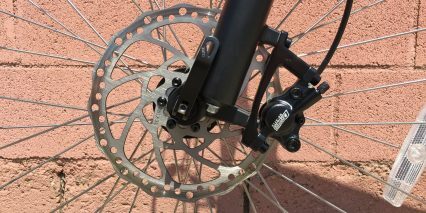 Neco, Threadless Integrated 1 1/8"
The highly anticipated, industry disrupting affordable speed pedelec from Juiced Bikes has finally arrived. 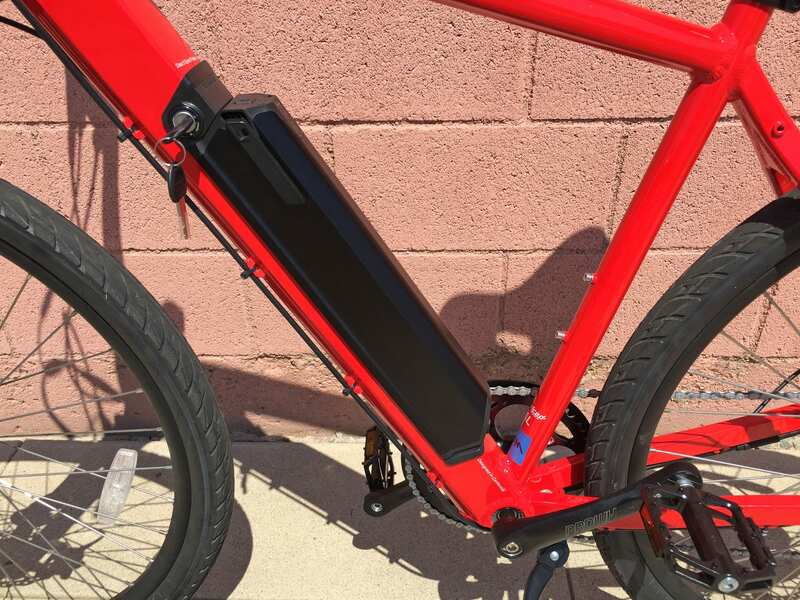 The CrossCurrent is a $1,500 electric bike that can go ~28 mph if you are willing to pedal with some gusto… Or you can get the optional trigger throttle and struggle to hit higher speeds while draining the battery more quickly. 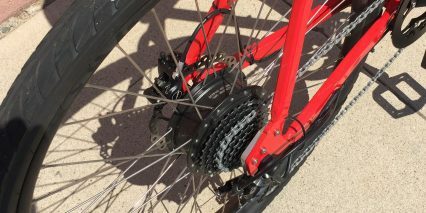 For this review I got to test ride a red, XL sized Cross Current using the stock 48 volt 7.8 amp hour battery. 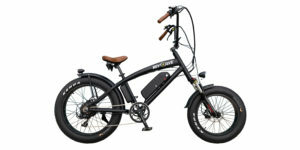 The motor on all models is 350 watts, what I usually see for average specced 20 mph ebikes, made by one of China’s largest manufacturers Bafang / 8Fun. 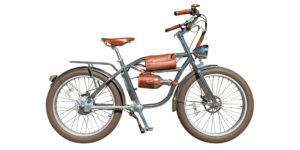 In short, this bike is awesome because it gives you choices. 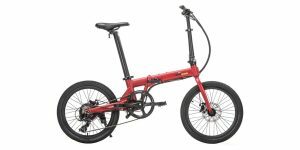 You can upgrade the battery, add that throttle, get a size that fits, choose a color that’s cool or get two and keep them separate. 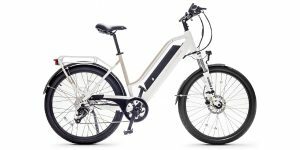 Nothing on the bike is truly remarkable but the combination of thoughtful design, solid mid-level parts and an impressively low price point make it a winner. 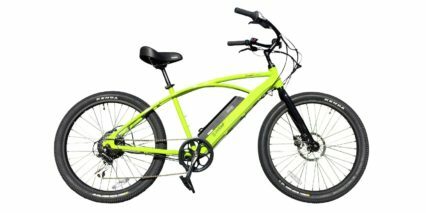 This electric bike would make for an excellent commuting platform because it goes fast, is well balanced, isn’t too heavy, has a removable battery pack to top off during the day at your desk, is easy to lift and carry up stairs if necessary (due to the wide open triangle frame) and can accommodate both a bottle cage and rear rack! 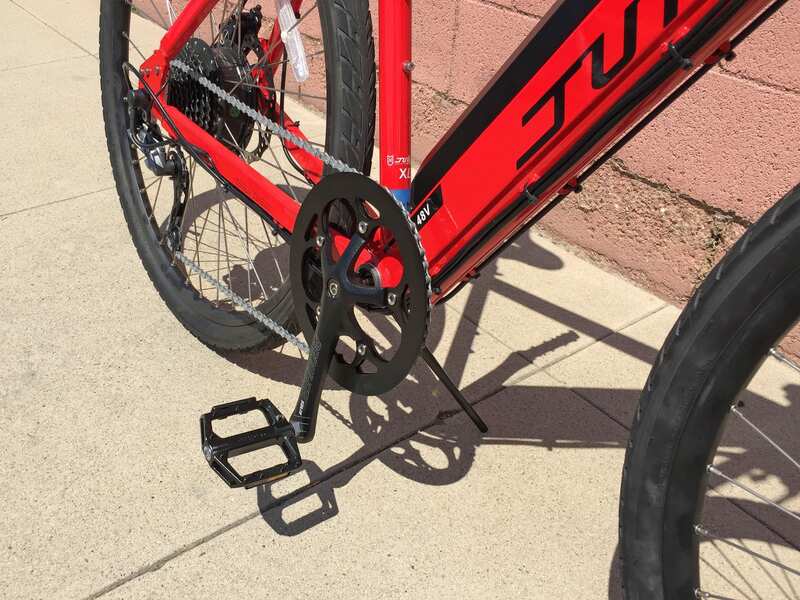 Bingo… and you won’t feel terrible if it gets a little dinged up at the rack because it didn’t cost $3k+. Note that the display panel is simple and limited… but also compact and less noticeable. It’s not removable but even as-is won’t take the same damage and attention that a large fancy LCD might. 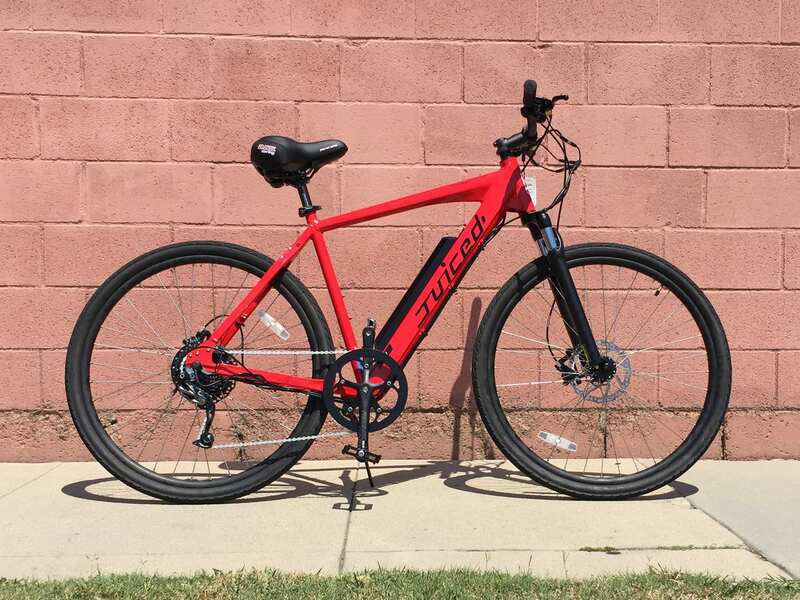 So many good choices have been made with this bike… To me it’s like they took a standard affordable decent looking ebike and just unlocked the higher speed. In my opinion you’re not really getting higher power, just a motor that’s not governed. 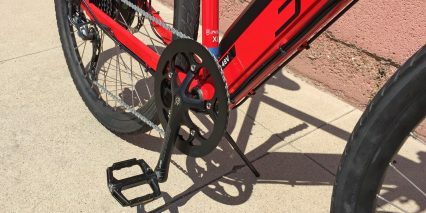 And with the mid-level Shimano Alivio drivetrain offering 9 speeds you can move the bike with or without power efficiently at a wide range of speeds on varied terrain. 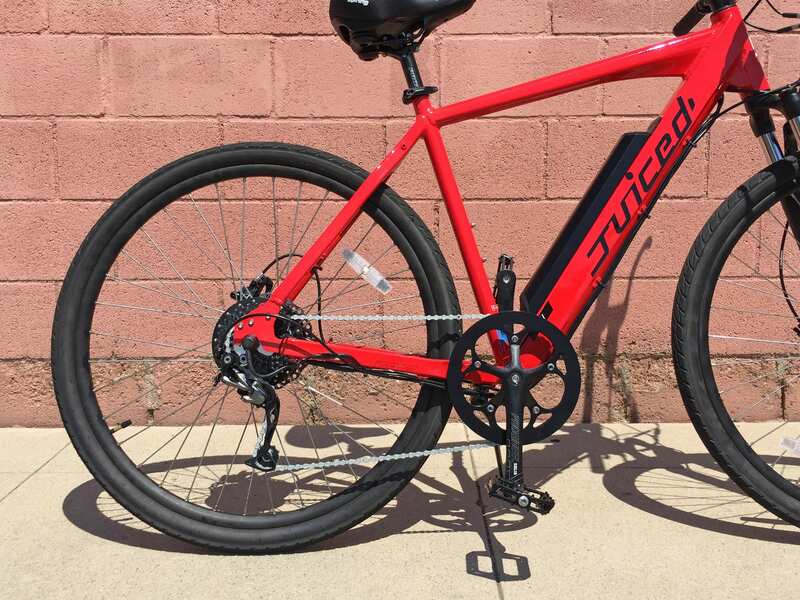 I love that the bike comes with slightly fatter tires but that it still opts for 700c large wheels for improved road efficiency. 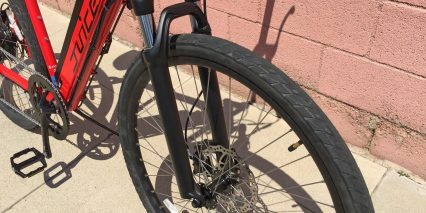 I like the suspension fork, not only does it add comfort but it blends in and gives you some adjustability with lockout. 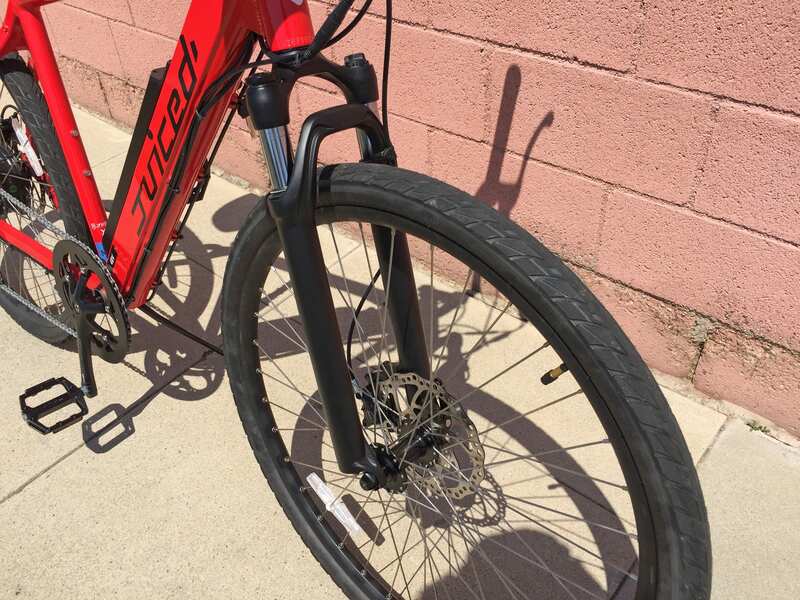 Sometimes cheap bikes try to make up for their lower price with flashy colors and stickers and graphics… and ahh, it’s a mess. 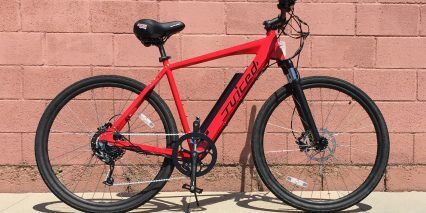 With this bike Juiced Riders kept style points up by limiting decals and it paid off. 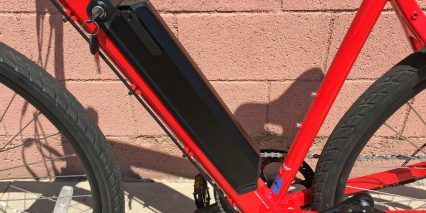 The list of features that deserve recognition and appreciate is long so here goes: integrated downtube battery that feels solid when mounted and stays hidden (especially on the black frame), large hydraulic disc brakes for easy but powerful sstopping, upgraded Wellgo brand platform pedals that offer good power delivery and stability, a quality name brand saddle that feels good, locking grips, a kickstand! 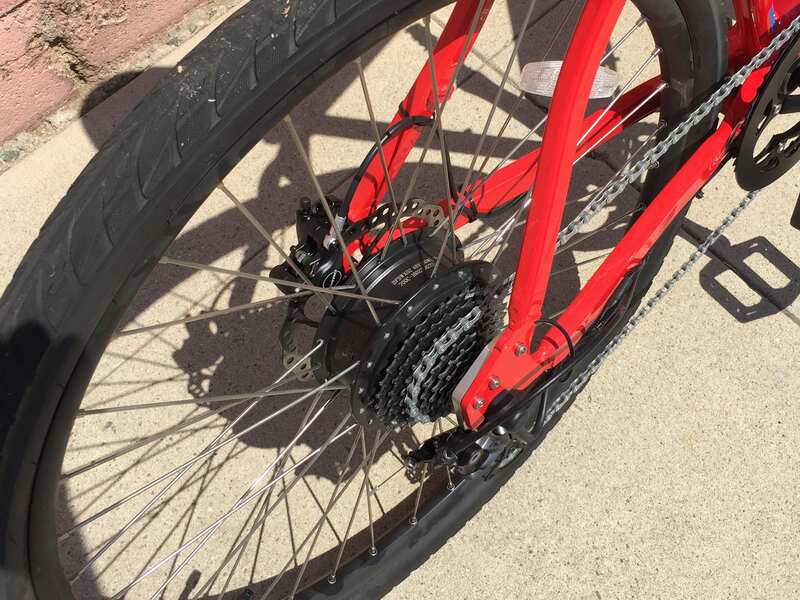 (though it could be better), thicker rear spokes to help support the weight of a fully loaded rack, name brand stem, headset, chainring and crankset and a quick release front wheel. 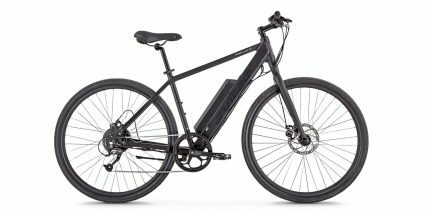 So should you buy this bike!? 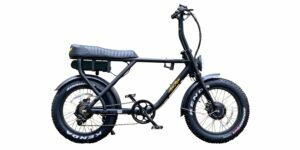 That’s an impossible question to answer without knowing the budget, proposed load weight, intended use and ride style but I do think it would work well for many situations. 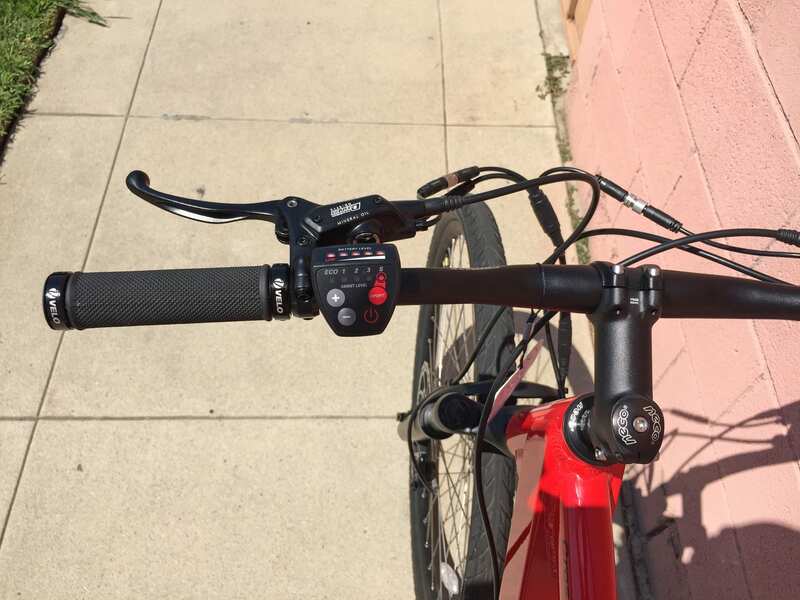 For me the body position felt aggressive and active and the torque sensor was smooth so it’s great if you like pedaling and just want some help going faster and further. 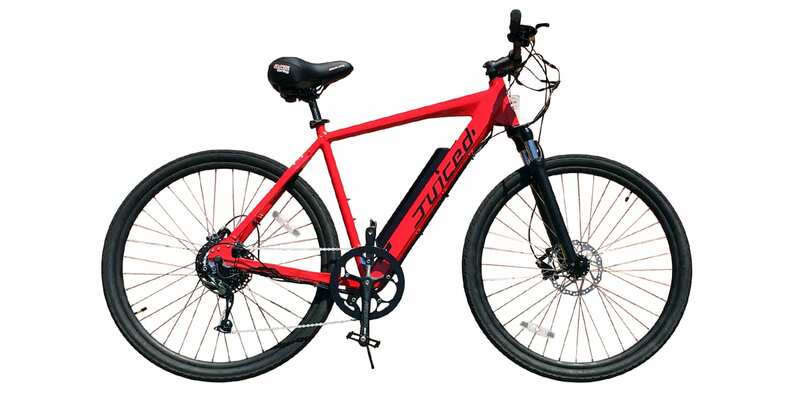 If you want to relax, don’t want to work as much and plan on encountering bumpy terrain this design might be less comfortable than a cruiser or fatter tire city bike. 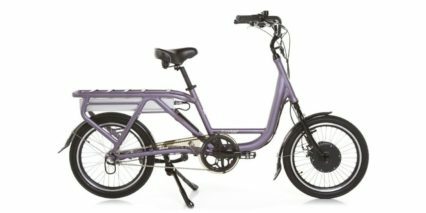 I love the different size options and the colors are fun but would love to see some options for integrated lights, fenders and a rack. 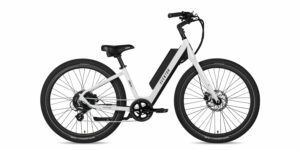 I think it’s smart that they offer an upgraded battery size and the throttle (wish I could have tested it). Note that the USB charging port seems to have been disabled and that actually plugging in a USB device or even the charger is kind of tight at the base of the pack. If the USB worked I’d praise it for facing the plug up vs. sideways where it could be more easily kicked. 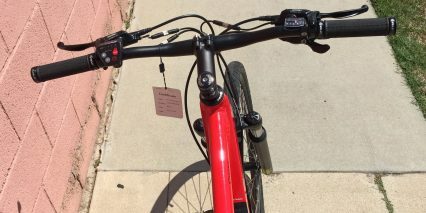 All things considered it’s a cool bike and one that I have been waiting to review for a while. 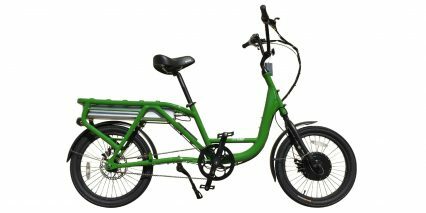 They are dialing in the features here and I suspect that as with their cargo bike, we’ll see minor adjustments and improvements over time. 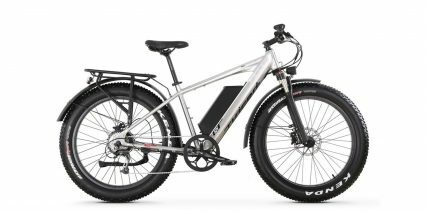 I love the integrated battery design, it’s still removable for easy charging and reduced weight during transport but it doesn’t stick up and just feels more solid than an external pack, I love that the main triangle is so open because it makes hanging on a car rack easier and there’s even room for a bottle cage! 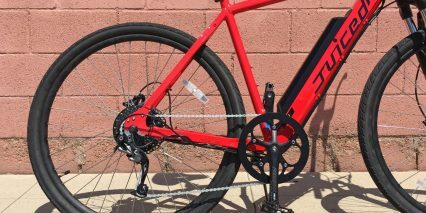 I like the angled look of the frame tubing, appreciate the two color options and LOVE that it’s available in three different sizes… hopefully we see a step-thru version someday too! Thorough, fair review…and yes, a long time coming. Good job, Court! 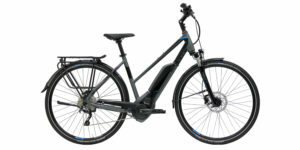 Thanks to EBR (and of course Court), I ended up with a ‘finalist’ list of 11 ebikes when it came time to ride and buy. 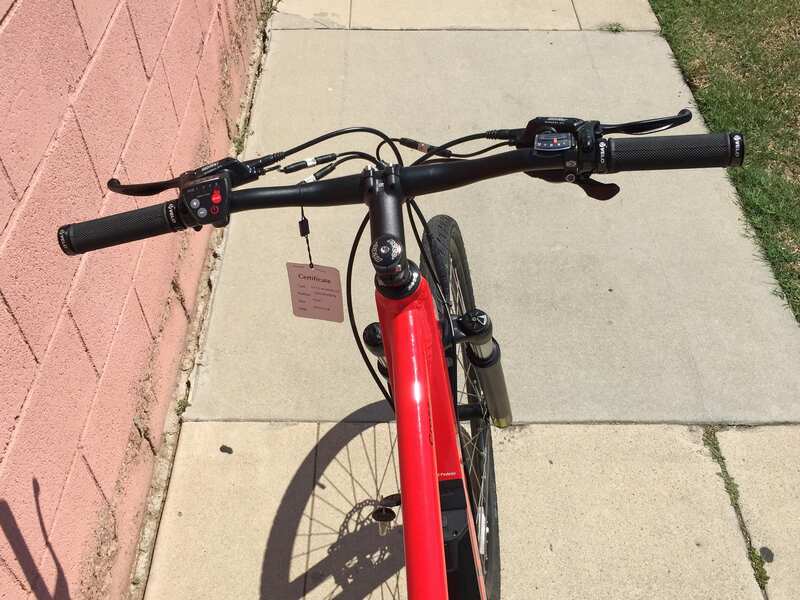 I was amazed at how good the CrossCurrent felt and how enjoyable it was to ride when compared to the others. 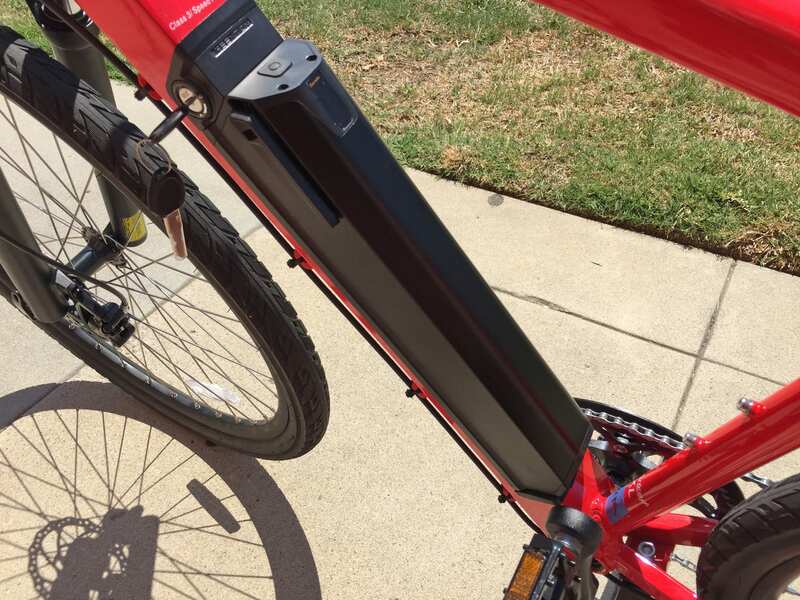 It’s even pleasant to ride with no power selected; some ebikes are not. I’ve ridden it three months now and am very pleased. 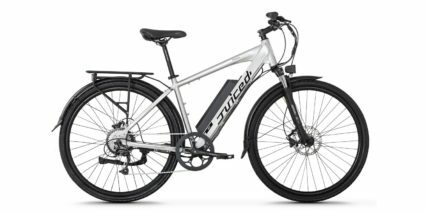 IMO it’s main weakness – and not mentioned in the review – is the poor (essentially zero) info on battery status. 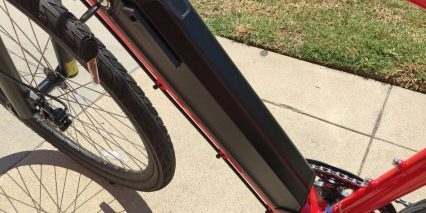 The LED’s only reflect the battery’s standing voltage at any given moment, so while riding at different power levels the LEDs move up & down, indicating more/less charge, depending on demand. 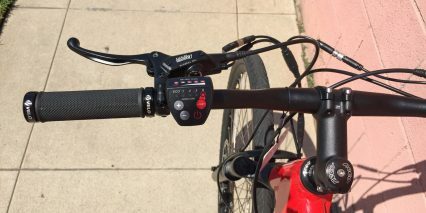 This issue is magnified by the bike lacking an easy interface to a true battery monitor like a Cycle Analyst. 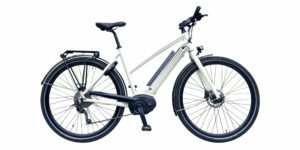 This can become essential for the commuter if the stock 7.8 AH battery is chosen. 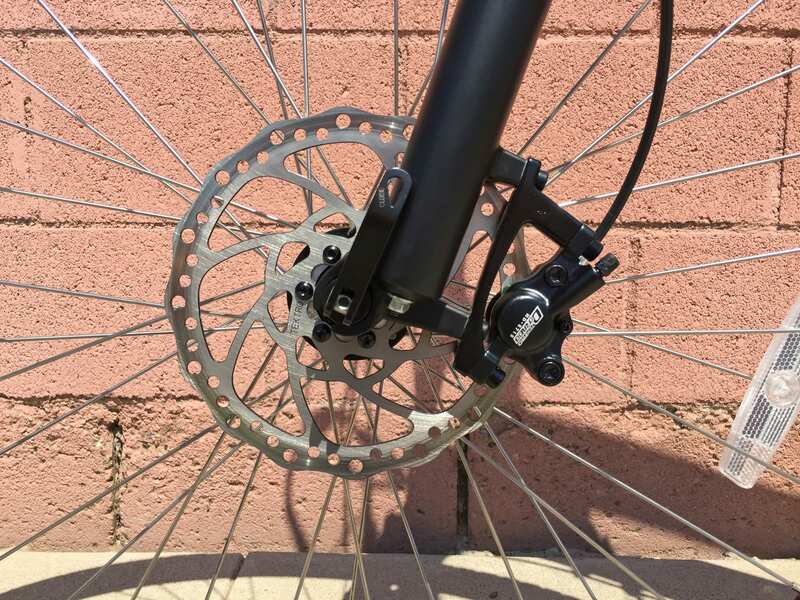 Ideally, this will be one of Tora’s upgrade paths…and the bike deserves it to be. One last observation: I had some initial problems with the battery charger…or was it the battery itself? 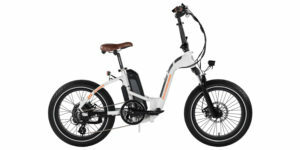 Tora’s support was instantaneous and the relatively low cost of the CrossCurrent does not reflect lessened after sales customer service one iota. This is a really solid choice at a very competitive price.